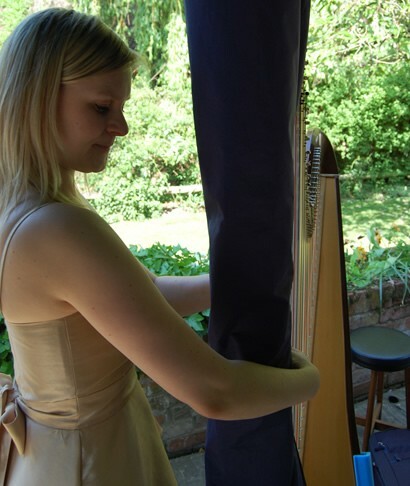 A Day In The Life Of West Sussex Based Harpist Amour Harp ...An Amazing Wedding Harpist For Hire! 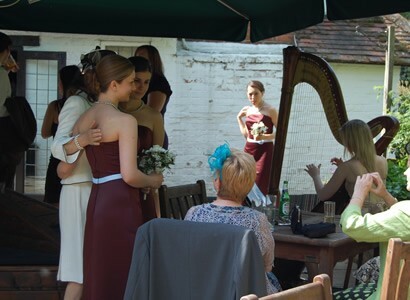 Highly recommended young harpist, Amour Harp, provided an elegant backdrop to a wedding ceremony and drinks reception held at The New Mill restaurant in Eversley, Berkshire on Friday 6th May 2011. 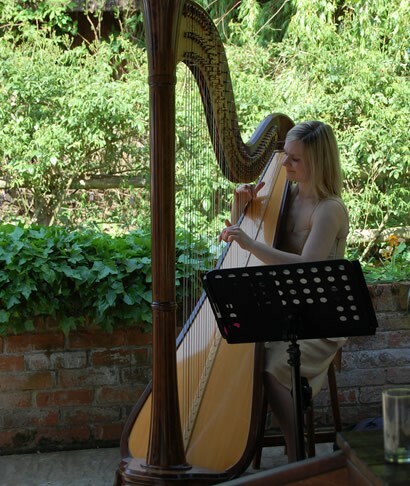 Amour Harp provides an insight into life on a gigging day for a harpist, in her a day in the life blog complete with photos and video. ... put the polystyrene edge protectors on the extended soundboard, then the base cover. After that there’s another cover for the column, and then a cover which goes over the whole harp. 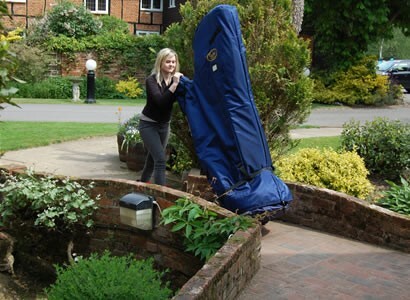 Next, I have to put the harp on its trolley so I can move it easily. It weighs about 35kg so lifting it is out of the question. Better make some lunch for myself and my boyfriend who is my roadie (and photographer) for the day. Always best to make something at home, motorway service station food is not the best. Particularly if you’re vegetarian! 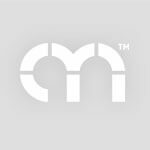 Our flat is located in an apartment complex which has disabled access – wide walk ways, electronically operated doors, lifts and ramps. Perfect for manoeuvring my harp! My car is a Vauxhall Astra estate. It’s roomy enough to accommodate the harp and all the equipment I need to perform, as well as a couple of suitcases if I’m performing far away from home. 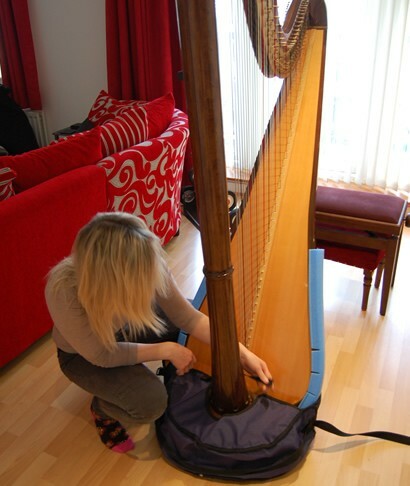 To get the harp into the car, you lay it down resting on the bumper, then lift the base and slide it in. My car is lined with foam and an old sleeping bag to protect the harp when it’s in transit. 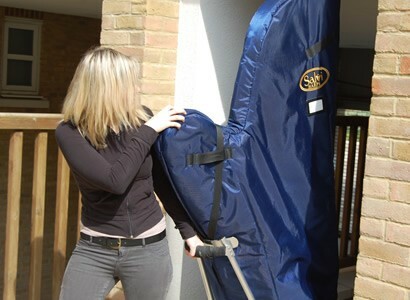 The rest of the equipment goes in: my music stand, sheet music, outfit and shoes, stool, strings, and a small amplifier. I seem to spend half my life on the M25. It’s a stressful motorway, but I can’t really avoid it living in South East England. It’s best to stay positive! I’ve finally arrived at the venue. All the equipment gets unloaded first, before the harp. The harp makes its grand entrance. Unpacking the harp in the ceremony room. As Stravinsky allegedly said “Harpists spend ninety percent of their lives tuning their harps and ten percent playing out of tune.” I try very hard not to play out of tune, but I do seem to spend a large part of my time tuning my instrument! 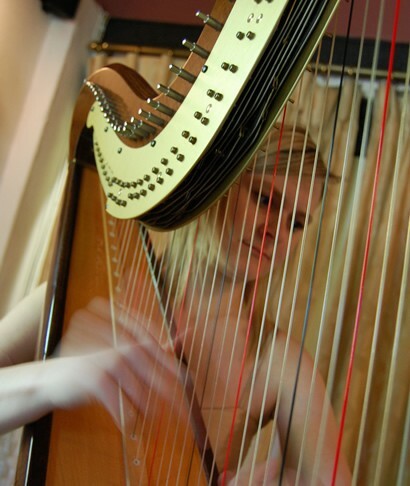 So many things can affect the tuning – moving the harp around, the temperature and moisture in the air. I always tune up before each performance with my handy electronic tuner plugged into the pickups inside the soundboard. 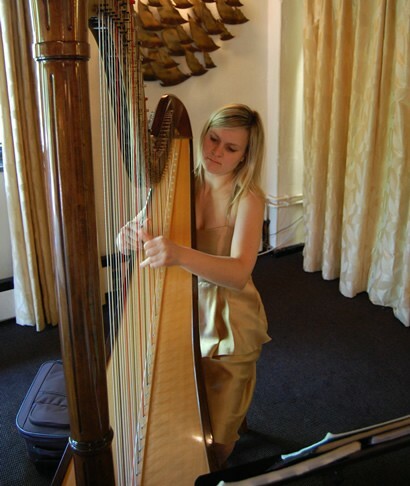 After changing into my gold cocktail dress, a few scales and arpeggios to warm up before playing for the ceremony. When playing for a wedding or civil partnership ceremony, I start playing about half an hour before the ceremony is due to begin, while the guests are arriving and waiting. Then I perform a piece for the bridal entrance, a few pieces for the signing of the register, and a piece for the couple’s exit together. 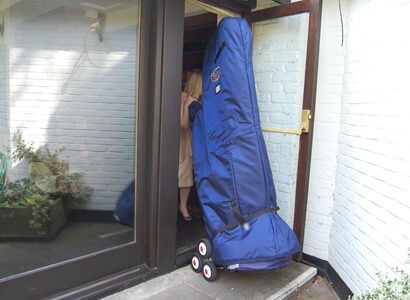 Today I am playing for the drinks reception as well, and it’s over in the other side of the building, so I’ve had to pack my harp up again and put it back on the trolley so I can move it across. Today is the perfect day for performing outside. It’s warm, sunny and dry, and perfectly still. No music flying around in the wind! 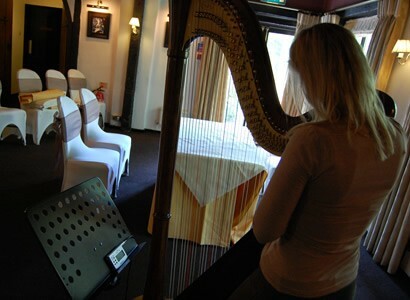 The harp is perfect for background music during the drinks reception. 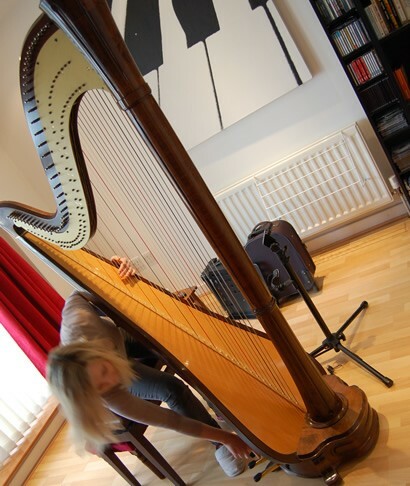 The sound is not too intrusive, and the instrument provides a beautiful backdrop, as well as being a talking point for the guests, many of whom may not have seen a harp in real life before. The wedding breakfast is approaching and it’s time for me to pack away and leave. Covers all back on, I say my congratulations and goodbyes to the bride and groom, get changed, load the car and drive back home! Can’t wait for a cup of tea when I get back.